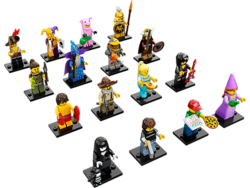 71007 Minifigures Series 12 is a group of sixteen Minifigures released in 2014. They are not based on any film/television franchise, unlike the two previous minifigure series. "Get your hands on the exciting Series 12 minifigure mystery bags featuring 16 all-new characters and accessories to trade and collect!" 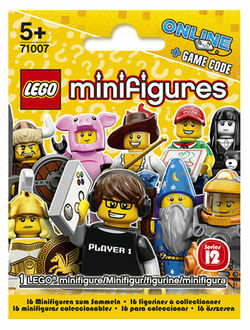 This series was the first to include Game Codes for LEGO Minifigures Online. This is a description taken from LEGO.com. Please do not modify it. (visit this item's product page) The new LEGO® Minifigures Series 12 collection is here! With 16 all-new, special minifigures in Series 12, the LEGO® Minifigures Collection continues to grow. Each minifigure comes in a sealed ‘mystery’ bag with one or more accessories, display plate and collector’s booklet. Inspired by movies, history and just everyday life, this collection includes a Space Miner, Battle Goddess, Wizard, Dino Tracker, Swashbuckler, Jester, Piggy Guy, Hun Warrior, Fairytale Princess, Pizza Delivery Man, Video Game Guy, Spooky Girl, Prospector, Genie Girl, Rock Star and a Lifeguard. As an added bonus, log onto LEGO.com/minifigures and enter the unique code included with each minifigure to unlock the character in the all-new LEGO Minifigures Online multiplayer game. PLEASE NOTE: Only 1 of 16 individual minifigures in each ‘mystery’ bag. Unfortunately, we cannot accommodate requests for specific minifigures – and some minifigures may be more difficult to find than others. If you purchase more than one set, you may receive 2 or more of the same minifigures – trade with your friends to collect them all! A maximum of 16 minifigures may be ordered per address, per household. Facts about "71007 Minifigures Series 12"
This page was last edited on 26 April 2019, at 01:44.